A picture’s worth a thousand words. You get the point, so will the Archie gang. As New York Comic Con 2014 rolls to the end of its second day, the news blasts are coming fast and furious from our friends at Dark Horse Comics. 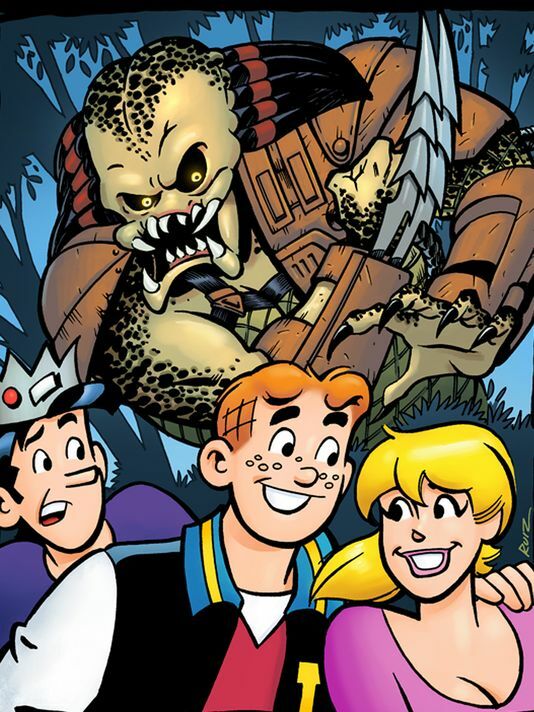 The latest communique alerts us to a totally loony franchise collision that puts extraterrestrial horror hounds, the Predators, dogging the trail of the Archie Comics crew. Hey, my favorite Universal Monster film is Abbott and Costello Meet Frankenstein, so I’m there. April 2015 brings the first issue of Archie Meets Predator a 4 part Alex de Campi (Grindhouse) and Fernando Ruiz saga set during spring break in Costa Rico. I haven’t seen a preview but I’m thinking Betty and Veronica camouflaged in spa mud. If that’s a spoiler, I’m clairvoyant. If it’s not, I’m a twelve year old. Author de Campi promises the whole Archie crew in tow. His interview with USAToday is here.